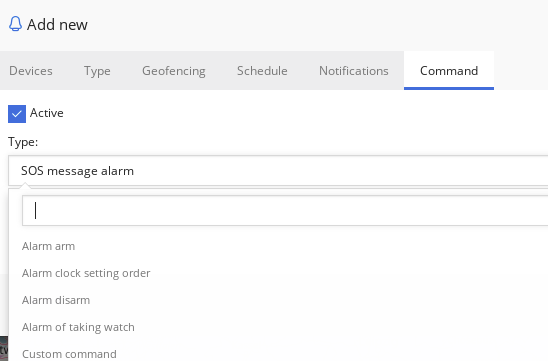 To create an alert choose "Alerts" in "Tools" menu on the main map window and press "Add alert" button (blue "+" symbol icon) on alerts panel. A new panel window will be opened. Start creating an alert by filling required information. Enter alert name (required) and select objects (required) for which alert will generate. Select alert type from the list. There are 7 types described as follows. 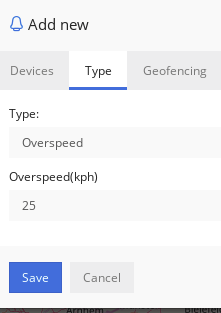 Overspeed - this alert will generate when objects overspeed the value entered. 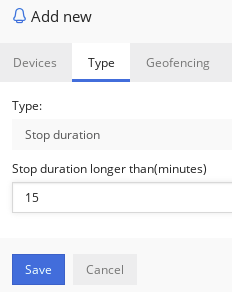 Stop duration - this alert will generate when object is not moving for defined time in minutes. 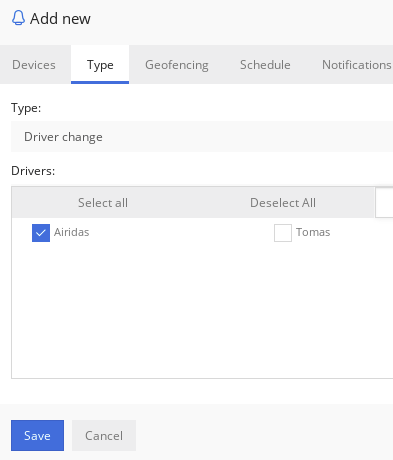 Driver change - this alert will generate when driver on object changes from selected drivers in the list. 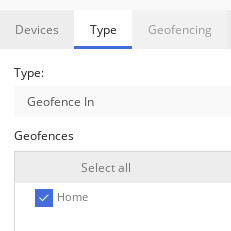 Geofence In - this alert will generate when object travels into geofence. 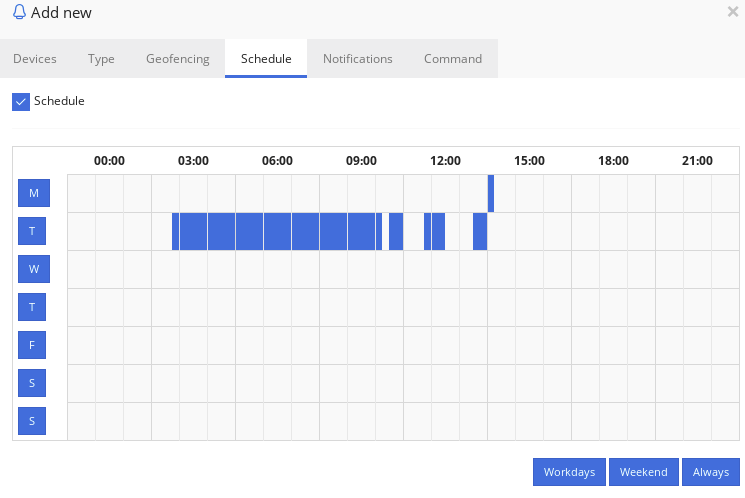 Geofence Out - this alert will generate when object travels out of geofence. 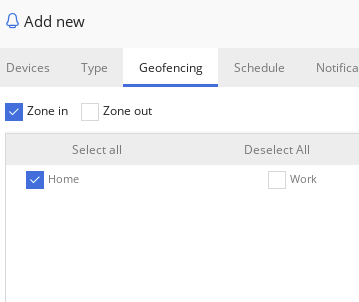 Geofence In/Out - this alert will generate when object travels in or out of geofence. 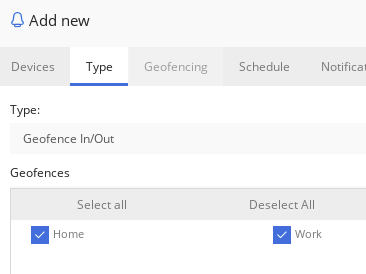 Note that when selecting "Geofence In", "Geofence out" or "Geofence In/Out" alert types, "Geofencing" tab will be disabled. 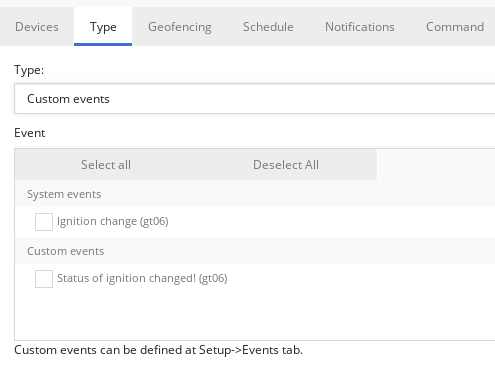 Custom events - this alert will generate when user created custom or system wide events are generated. 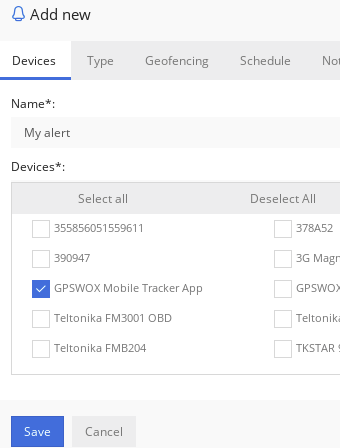 Select geofences that will generate alert when object will be moving inside or outside geofence. 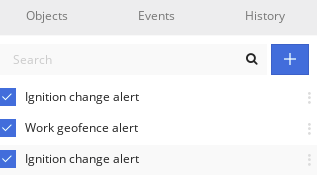 This will work together with other type of alerts. 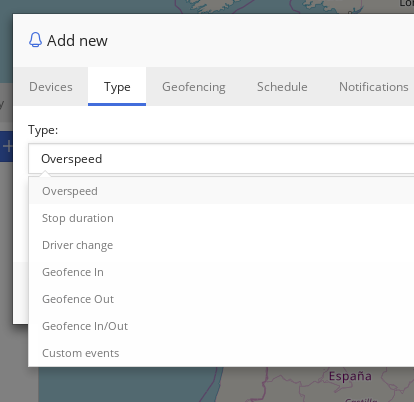 For example it will generate overspeed alert only when moving inside or outside geofence. 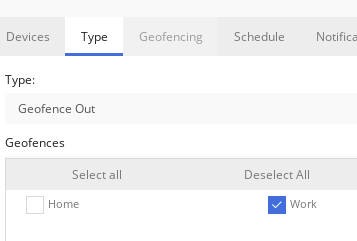 Select when alert will be active. Press the mouse and paint on the calendar table. One table item is 15 minutes. Exact time stamp can be seen by hovering over the item with a mouse. 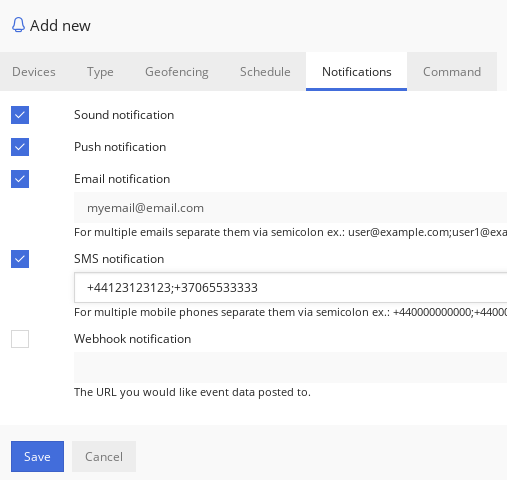 Select which notifications a user will get when alert generates. There are sound notification that makes sound on web browser once alert generates. Push notifications works also on mobile apps. Email notification will send an email. SMS notifications will be sent to the numbers provided. SMS Gateway must be enabled to show this part of Notifications. 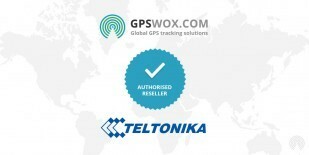 Webhook notification will use HTTP protocol to p[ost data to given address. Select command to activate when alert generates. 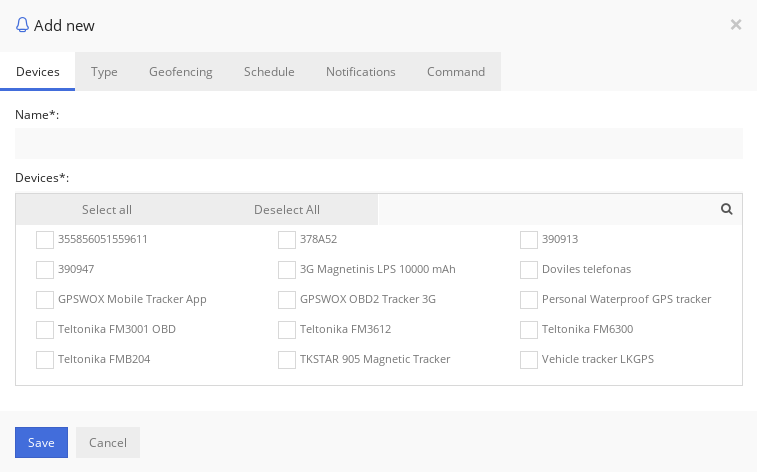 Command will be sent to device trough GPRS network. Pressing "Save" button will finish alert creation steps and closes alert creation window.